In Hinduism, there are many Gods (devas) and Goddesses (devis). In most schools of Hinduism, there is only one ultimate reality (Brahman), and the Gods and Goddesses are aspects (avatars) of this. 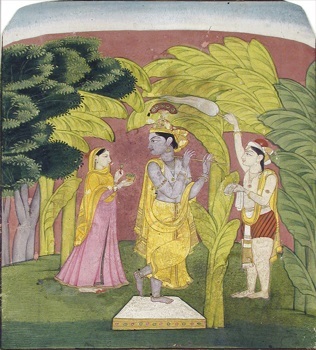 The choice of which Gods or Goddesses to worship as a chosen diety (Ishvara) is a matter of personal choice, although there are often both family and regional traditions. There are however also polytheistic schools of Hinduism which do not consider the deities to be aspects of Brahman, but to be separate Gods. In the Vedas (sacred scripture), 33 deities are listed. This is followed by the word "koti" in Sanskrit (an ancient Indian language). The most appropriate translation for "koti" is probably "class", meaning that the 33 deities are all classes or aspects (avatar) of the One Supreme Being. Another possible translation for "koti" is "ten million", and it is from this translation that the figure of 330 million deities emerges. Some people claim that this is simply a mistranslation, whereas other people claim that 330 million is symbolic of infinity - indicating the infinite forms of God. Finally, another view is that 330 million corresponds to an estimate of the world population at the time the Vedas were written, and thus was meant to indicate each person has their own personal experience of God. For further information about what Hindu beliefs, please review our recommended further reading on Hinduism.